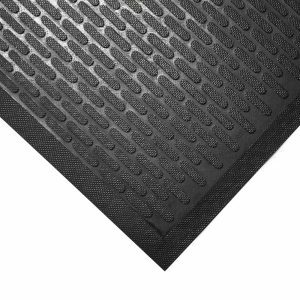 A hygienic pad of peel-off adhesive coated, disposable sheets manufactured from an anti-microbial agent to protect against bacteria, mould and mildew. Once applied to the floor the self-adhesive backing keeps the mat in place. The ‘tacky’ sheets capture dirt and dust from footwear and wheeled equipment for contamination control. When the top sheet becomes soiled, simply peel off to reveal a clean layer. Ideal for hospitals, clean rooms, general industrial and food contact applications.